The Backstreet Boys finally broke and broke big in America during 1998, as if by design. They had been Euro sensations for a couple of years, but it wasn't until Backstreet's Back was unleashed in the U.S. in 1997 that they had a presence in the States, and it was no small presence, either -- after selling over ten million copies, the album remained in the Top 40 on the eve of the release of its sequel, Millennium. 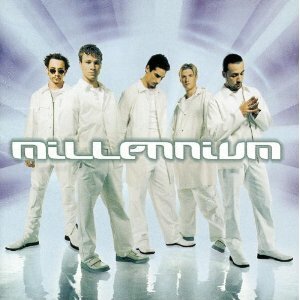 And sequel is the appropriate word -- Millennium has no pretense of being anything other than an album for the moment, delivering more of everything that made Backstreet's Back a blockbuster. There's a familiar blend of ballads and dance-pop, a similar shiny production, a reliance on the Boys' charisma that brings to mind the debut. If Millennium were anything other than big, glossy mainstream pop, such calculation may be a little unseemly, but in this context, it can be rather fun. True, the album doesn't pack as much punch as its predecessor -- there's a number of good songs, but more filler than before, and the Backstreet sound isn't as fresh as it was the first time around -- but it does deliver what fans want: more of the same. And since there are singles as infectious as "I Want It That Way" and a handful of good ballads, that will be enough to satisfy anyone craving more, more, more.